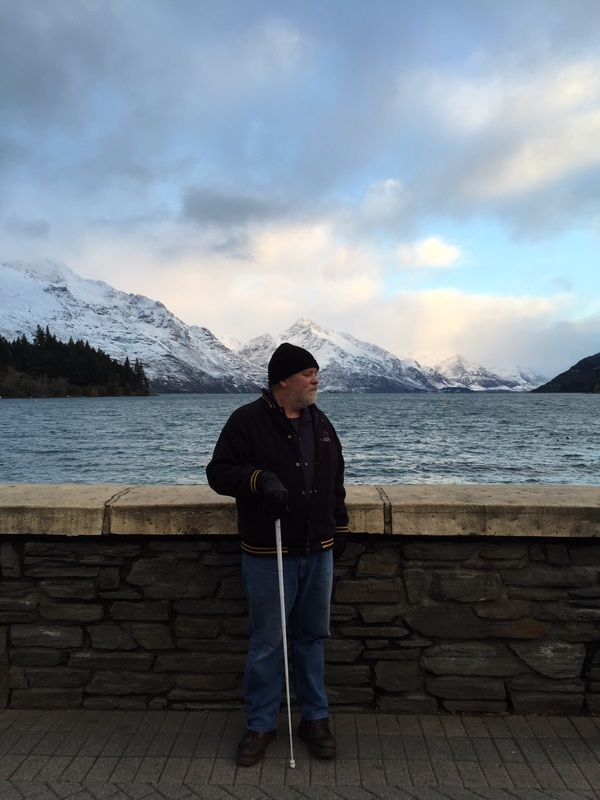 In May 2015 we once again traveled with a group of 35 vision impaired and sighted guides on a VI tour of the spectacular New Zealand south island town of Queenstown and Surround. 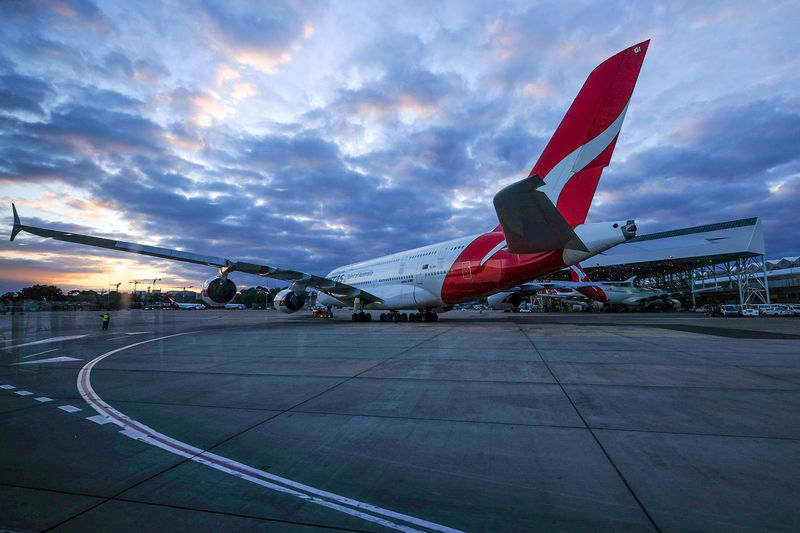 Flight out of Perth at 12.05am got us into Sydney around 6am. Transfer to an international flight leaving at 9.20am arriving 2:25pm in Queenstown New Zealand where we were met by local Guides. Just enough time to do a little unpacking and a short walk around the hotel area to strech the legs.Welcome dinner at 6.30pm for our first group dinner, held in the Elements Room at the hotel. Overnight the tempreture dropped well below zero with a 30cm snowfall. Many in our group had not experienced snow so we got together for a group walk, a little on the slippery side, but we did get to take our first look at Queenstown covered in snow. 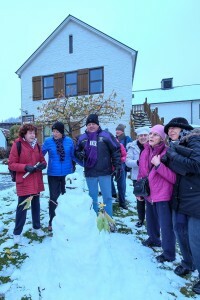 According to the locals snow in the town like this had not been seen for 15 years. Built a snowman in front of the police station, had a bit of a snowball war. lots of fun. 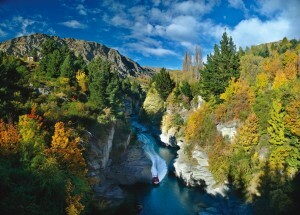 We were to have our first adventure that morning with Queenstown Rafting for White Water Rafting on the Kawarau River. With the snowfall it had snowed everyone in and the raft masters were unable to leave their homes, so the rafting was put on hold. 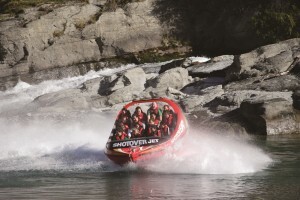 Straight into our 2nd adventure, life jackets and wet weather gear for our jet boating experience on the Shotover River. A wild and exciting ride! 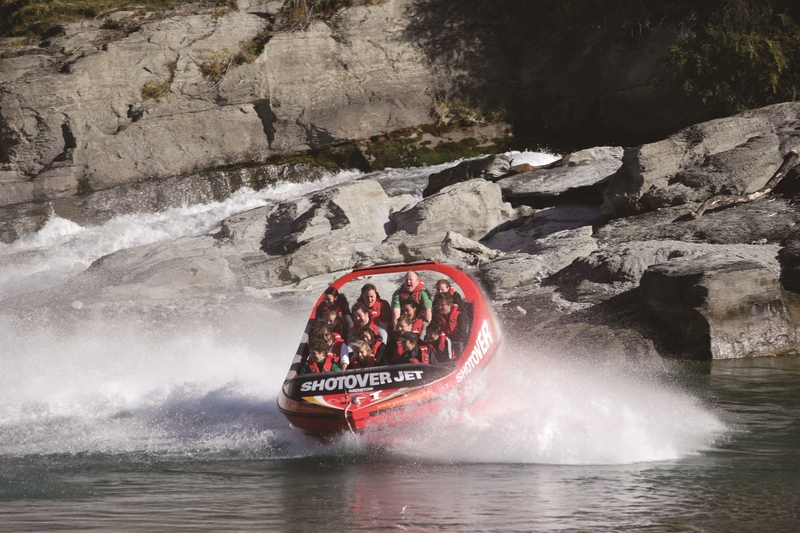 It is Queenstown’s world famous jet boat ride, Shotover Jet has thrilled millions of people since 1965. 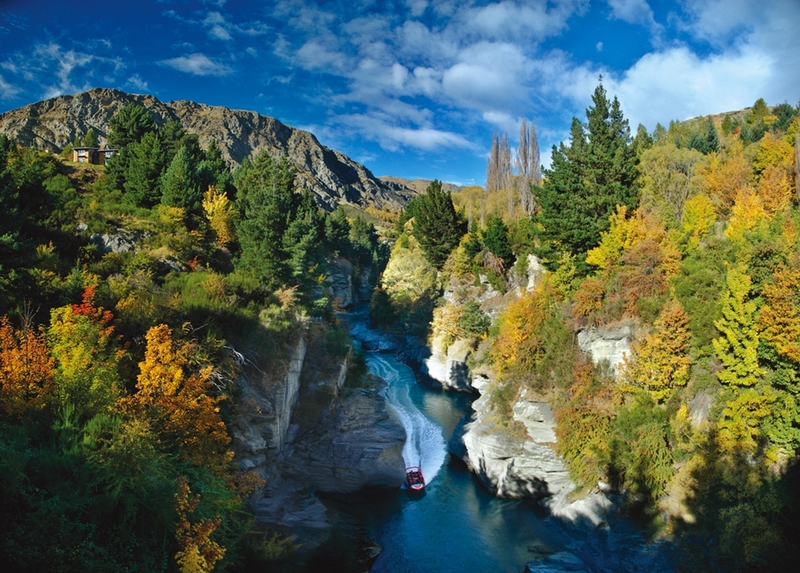 We took our spin in the iconic ‘big red’ through the spectacular Shotover River Canyons! At 1:30pm we returned to the Hotel, hit the town for some sightseeing and a drink. It wasn’t long before our cold tolerance was tested again. Came across this bar on the lake foreshore that was completely made of ice. So after donning the appropriate garb went in for a few cocktails. Very cold and weird experience. 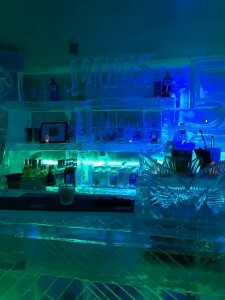 Tonnes of crystal clear ice architecture, extreme temperatures at MINUS 5º and colder, Dressed like an Eskimo you get to explore ice furniture, hand made ice carvings and even drink from ice glasses filled with their famous delicious cocktails. 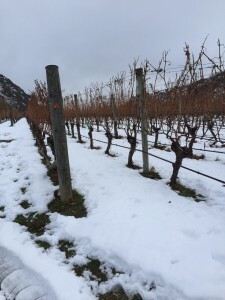 Visited the Gibbston Valley Winery. We were taken for a tour of the Winery, visiting the Wine Cave . A bit of a taste of New Zealands finest wines. Not too shabby! had lunch at the winery with a Cheese tasting of 5 different cheese styles, all localy made. 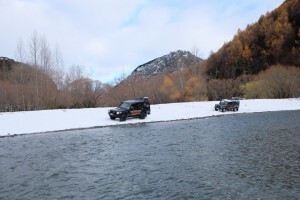 Today we took a 3 hour 4WD Arrowtown Activity Tour; showcasing Arrowtown, up the Arrow River where a Gold Rush happened in 1862. Had a crack at some Gold panning, whilst learning a little of the history and hardship faced by miners in those early days. We then visited the Lord of the Rings filming locations in Arrowtown and other historic sites before stopping off for lunch at the Arrowtown Post Masters. 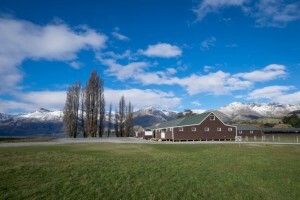 Historic Arrowtown, a New Zealand treasure, with its beautiful buildings and famed nature trails. It is a scenic 25 minute drive from Queenstown, and a popular winter base for international ski teams. Arrowtown is charming and quirky – a delightful gold rush village nestled below the beautiful peaks that surround the sparkling Arrow River. The heart of its history is Buckingham Street, a procession of small town heritage buildings that stretch into a tree lined avenue of tiny miners’ cottages. A 9:00am Depart for our tour leaders, Jo and George’s house, in Clyde. Once again we had lunch at the Clyde Post Office. Seems to be a popular spot for lunch in small towns in the area. 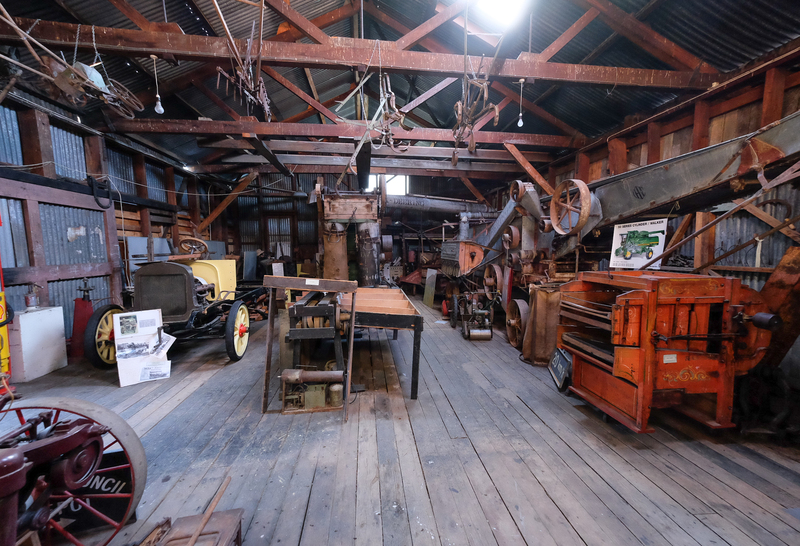 After our lunch we visited the Briar Herb Museum, for a Touch tour of the Museum and a short talk about mining and the fruit industries around the Central Otago district. Our guides for the Museum tour were students from the local primary school, and they did a fantastic job of it! On our homeward jurney to the hotel we visited the Jackson’s Fruit Market in Cromwell for some seasonal fruit tastings. Some tasty treats there. Grabbed a couple of blocks of kiwi fruit chocalote! For dinner tonight we finally got a table at the Cow Restaurant in Cow Lane. Simple Italian food, pizza and pasta, but really good. Today we took a ride on the Spirit of Queenstown for a cruise across Lake Wakatipu to the Mt Nicholas High Country Station. Mt Nicholas offers an authentic merino farm experience. We Followed the wool journey in a fun and interactive environment from rounding up sheep with a sheep dog through to the creation of IceBreaker clothes. 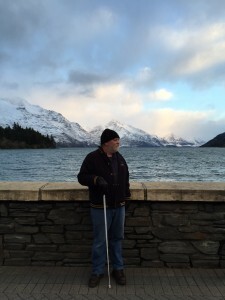 Lake Wakatipu is an inland lake (finger lake). It is in the southwest corner of the Otago Region, near its boundary with Southland. Lake Wakatipu comes from the original Māori word Whakatipu. With a length of 80 kilometres (50 mi), it is New Zealand’s longest lake, and, at 291 km2 (112 sq mi), its third largest. The lake is also very deep, its floor being below sea level, with a maximum depth of 380 metres (1,250 ft). 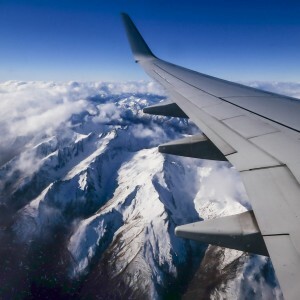 It is at an altitude of 310 metres (1,020 ft), towards the southern end of the Southern Alps. The general topography is a reversed “N” shape or “dog leg”. The Dart River flows into the northern end, the lake then runs south for 30 kilometres before turning abruptly to the east. Twenty kilometres (12.4 mi) further along, it turns sharply to the south, reaching its southern end 30 kilometres (19 mi) further south, near Kingston. In the afternoon we took the Gondola up Bob’s Peak to meet up with our zipline guides. This was fantastic fun. four zipline hurtles down the side of the mountin; each a little longer and steeper. You will get the idea from the footage below. While we were on top of the mountain, Dinner tonight was at the fantastic Skyline Restaurant on Bob’s Peak with another Gondola ride back down the mountain afterwards. Our last day, spent the morning cruising the town in search of gifts for people at home. 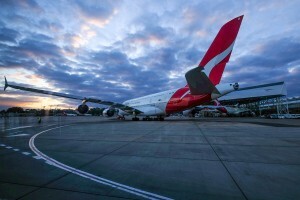 At 1:00pm our Coach picked us up for our trip to the Airport for our 3:20pm Qantas flight back to Australia.